Ryde Heritage Audio Trail launched on Saturday 15 May 2010 at St Thomas Heritage Centre, St Thomas Street, Ryde. Ryde Social Heritage Group worked with Living Links for two years to produce this exciting project. Living Links is a three year Heritage Lottery funded project to help local communities across Hampshire and the Isle of Wight celebrate their stories. The project is supported by the Isle of Wight Record Office and Hampshire Archives Trust. The project has provided support to local community groups by delivering Archive Ambassador training across the region and has also funded a number of creative projects including the Ryde Heritage Audio Trail. 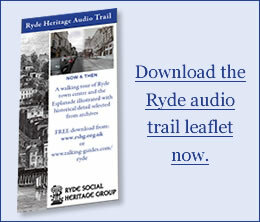 Ryde Heritage Audio Trail is a guided walk around Ryde, starting at Lind Street, going to St Thomas Square, down Union Street to the Pier, along the Esplanade to the far end of the Canoe Lake, then back along the Esplanade and up St Thomas Street ending at St Thomas Church. To walk the whole trail it will take about two hours and we have designed it to be accessible to wheelchair and mobility scooter users. Along the Trail there are seventeen stops where you will be able to listen to the audio files (on mobile phones, tablets and other devices). All of the stops are illustrated with historic detail about the town which we have selected from archives and the audio files have been professionally produced by a company called ATS Heritage and sound fantastic! Text files for each of the stops are available here. You can click the green play button next to any of the audio trails to listen to them. Depending on your web browser you can also left or right click the audio trail description to download the mp3 file. You can also download all of the mp3 files here as a zip file.